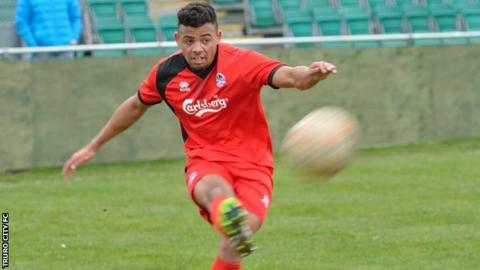 Truro City boss Steve Tully said there is great belief in his Southern Premier League side after beating Histon 7-2. City have won five in a row, scoring 17 in the last four, after Saturday's game in which Isaac Vassell scored a hat-trick, Les Afful notched twice and Matt Wright and Cody Cooke also netted. "We're in a great position, we've got a great group of players," Tully said. "The spirit amongst the players is different class and that's all you can ask for and we'll keep going." The win keeps City one point off the play-off places in seventh spot in the Southern Premier League, having only lost once since the end of October. "To score seven goals at home is always pleasing and we go on again," Tully told BBC Radio Cornwall. "It's one more game ticked off, but we've got to go again next week. "We'll keep believing, the goals are coming at the moment and defensively we're looking right as well. "The lads believe in themselves and I think we're in a position where we can challenge."